21 October 2013 - Franklin, Tenn - Multi-platinum recording artist Michael W. Smith has announced the dates for his annual holiday tour. Titled "Celebrate Christmas," the festive tour will run for ten dates, kicking off Dec. 1 in Murfreesboro, Tennessee and wrapping up Dec. 15 in Detroit, Michigan. Continuing a six-year tradition, Smith will perform two nights, Dec. 9 and 10, with the Dallas Symphony Orchestra. He will end the tour with another symphony concert in Detroit. All other stops will feature Smith with his full band and background vocalists, and at some dates an additional 18-piece string section. Each stop on the tour will also feature American Idol finalist Angie Miller, whom this past spring placed top three on the popular show. "I have looked up to Michael forever and have been singing his songs in church my whole life," Miller shares about the tour. "I am incredibly honored to be on this tour with him now!" In addition to Miller on the tour, for the Dec 5, 6 and 7 shows Smith will be sharing the stage with his good friends Third Day. Smith commented, "Anyone who knows me knows how much I love Christmas, so I always look forward to touring at Christmas. Having Angie Miller out with us will be a lot of fun. In addition to an incredible voice - she brings an excitement and enthusiasm to the shows that I think will be energizing. Christmas is special. It deserves to be celebrated and that's what we plan on doing!" As always, concertgoers can anticipate hearing many of Smith's biggest holiday hits, and are sure to get in the holiday spirit. 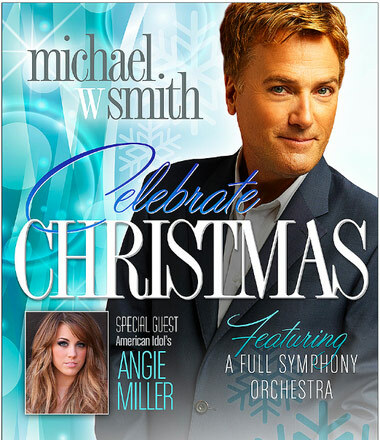 To find tickets in your area, please visit MichaelWSmith.com for more information. Throughout his 29-year career as a recording artist, Michael W. Smith has accumulated an impressive catalog of achievements. His 24 albums have garnered multiple honors including an American Music Award, three GRAMMY ® Awards, 44 GMA Dove Awards and 33 No. 1 radio hits. In addition, he holds 16 Gold, 7 Platinum and 2 Double-Platinum albums for career sales of 15 million. Inducted into the Gospel Music Hall of Fame in 2009, Smith has scored film projects, written 12 books and been featured by media outlets including "Hannity," NBC's "Today," ABC's "Good Morning America," "NBC Nightly News," "Larry King Live," "FOX & Friends," The Associated Press, Billboard, USA Today, The New York Times, The Washington Post, Los Angeles Times, Newsweek and more. Constantly giving back to the community, one of Smith's ongoing projects is Rocketown - a nightclub for teens in his hometown of Nashville, Tenn. - that serves as a safe place for young people to enjoy music and for artists to be discovered. He and wife of 30 years, Debbie, are the proud parents of five children.